Máté Bella’s new work was commissioned by the Musica Viva concert series of the Bavarian Radio Symphony Orchestra. Composed in 2014, its world première takes place on 20 February 2015 in the Munich Hercules Hall, as part of a Musica Viva weekend devoted to contemporary music. It will be performed by the Bavarian Radio Symphony Orchestra, conducted by Peter Eötvös. This publication is the first in the Peter Eötvös Foundation Series dedicated to new compositions by talented young composers discovered and supported by the Foundation. The title refers to the Lethe, one of the rivers of Hades found in Greek mythology. The meaning of the name is “oblivion.” Dead souls drank from it to forget their earthly life, whose memories might poison their life in Eternity. Tradition also makes the Lethe the symbol of time as a dynamic, flowing, changing entity. Máté Bella’s composition follows this ancient symbolic structure and renders musically the flow of the mythical river. French premiere of joint opera project Out at S.E.A. 6 composers, 3 singers, 3 instrumentalists, and 1 conductor: Out at S.E.A. is a joint project supervised by Péter Eötvös, Luca Francesconi and Balázs Horváth and supported by the Peter Eötvös Contemporary Music Foundation and the Budapest Music Center. After performances in Budapest and Milan the French premiere takes places at IRCAM in Paris on July 9. Out at S.E.A came into being as the result of a unique process, a combination of a composition workshop, a competition for composers, and a complex final phase of assembling the parts and creating and rehearsing the final result, a chamber opera. Or, rather, a double chamber opera, as the same libretto is set to music in two independent versions. The process started with a four-day chamber opera workshop in April 2013, supervised and guided by Péter Eötvös, Luca Francesconi, and Balázs Horváth. Here the 37 participants reviewed and discussed the special opportunities of the libretto by András Almási-Tóth, based on Sławomir Mrożek’s play Out at S.E.A. (Someone Eats All), and the questions of the dramaturgy and the compositional technique. The workshop was followed by the individual creative process, lasting for several months. After this six composers were selected to compose the music for one of the characters. What actually is Sławomir Mrożek’s one-act absurd drama all about? It is an embittered and disillusioned parable about issues of alienation, abuse of power, conformity, and the limits of freedom; about the possibilities of manipulation and the loss of belief in democracy. This is all packed into a grotesque but simple situation: three men in a boat have to decide which one of them should be eaten by the other two for survival. The three characters exemplify three types of people in society: the clever Manipulator, the cynical Conformist, and the eternal Victim. It may not be a pure coincidence that five of the selected composers, like Sławomir Mrożek and Péter Eötvös themselves, came from countries with limited democratic traditions: Máté Gergely Balogh and Samu Gryllus are Hungarian, Diana Soh is from Singapore, Koka Nikoladze from Georgia, and Mariana Ungureanu from Moldavia, while the sixth composer, Christian Flury grew up in Austria. The invited conductor of the chamber opera is the Taiwanese Lin Liao, and the viola, cello, and clarinet parts are being played by Hungarian and Romanian artists. The premiere of Out at S.E.A. took place in the Budapest Music Center on December 19, 2013, and the first production of its tour within the framework of the Ulysses Network was in Milan on February 26, 2014. The next event will be a performance at IRCAM in Paris on July 9, and there will be two more productions, one in Brussels (Flagey) and one in Mazsalaca, Latvia (International Workshop for Young Composers). Composer Sándor Szokolay passed away on 8 December 2013 at the age of 83. Members of his family, students and admirers bid their final farewell in the Lutheran Church and the Lutheran Cemetery in the town of Sopron on 21 December. Sándor Szokolay was born in Kunágota (in the southeast of Hungary) on 30 March, 1931. He studied composition with Ferenc Szabó and Ferenc Farkas at the Ferenc Liszt Academy of Music between 1950 and 1957. While still studying, he taught solfege in the framework of the Budapest Music School Organization. From 1955 to 1961 he was member of the editorial staff of the Hungarian Radio, then he was working as a freelance composer for some years. From 1966 to his retirement in 1994 he was professor of composition, counterpoint, and prosody at the Ferenc Liszt Academy of Music. He also took the position of music reader of the Hungarian Television between 1977 and 1988. He has actively participated in the activity of severalorganizations, among them the Hungarian Kodály Society, the Hungarian Music Chamber, the Hungarian National Foundation and the Hungarian Radio Foundation. Szokolay soon found his métier in vocal and dramatic music. He gained an impressive success with the oratorio A tűz márciusa (‘Fiery March’, 1957-58). In other works a definite inclination towards folk traditions developed. In these compositions, though he did not move far from Hungarian national intonation, he made reference to the ecstatic rhythms and instinctive expression of certain African peoples, so creating an individual style that shows certain affinities with the work of Bartók, Stravinsky and Orff. But all this was only a preparation for a major operatic undertaking, Blood Wedding (1962-64), based on Lorca’s play. While opera also played a major role in Szokolay’s oeuvre later, the intervening years saw the creation, alongside some instrumental compositions, of a number of oratorios and other choral works. His style was regenerated from the 80s onwards: he drew more from folk music and Gregorian chant, struggled to retain tonality and preserve melody, and continued to compose highly ornate vocal parts. In place of experimentation, his last period shows signs of concentration and summation. By the end of the 1990s he had composed three symphonies, enriching his life’s work with a new genre. A significant part of Sándor Szokolay’s works for orchestra, choir and chamber music were published by Editio Musica Budapest, and his compositions also constitute an important part of EMB’s educational publications. 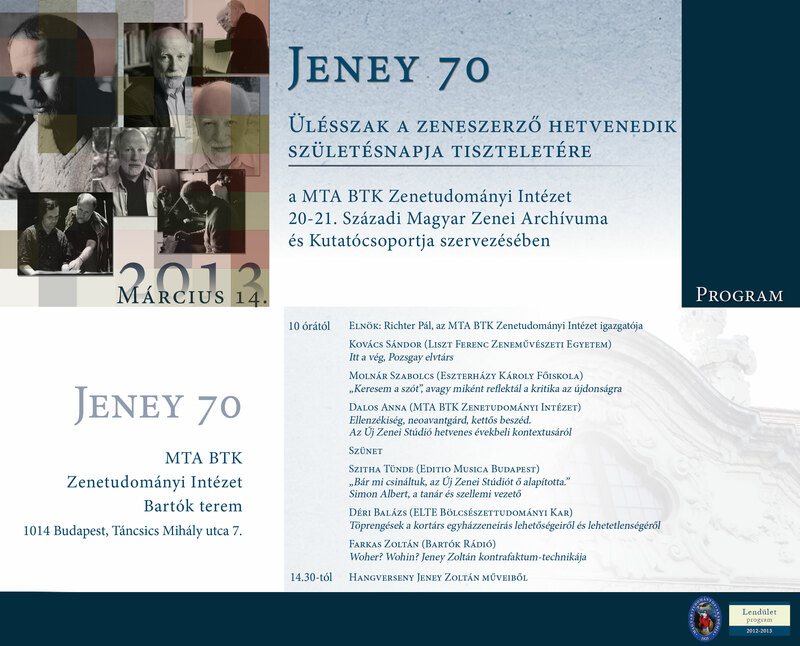 The Hungarian Academy of Sciences Research Centre for the Humanities Institute for Musicology is organizing a conference on March 14th, 2013, to mark Zoltán Jeney’s 70th birthday. From 10 a.m. lectures will be given by Sándor Kovács, Szabolcs Molnár, Anna Dalos, Tünde Szitha, Balázs Déri and Zoltán Farkas on the composer’s works and the history of the New Music Studio. From 2.30 p.m. the conference will close with a concert featuring a selection of Zoltán Jeney’s chamber music works. The ninth and last concert of the project "Europe through the eyes of Russians. Russia through the eyes of Europeans" (organized by the Centre of Contemporary Music, Moscow Conservatory) is dedicated to the musical connections of Russia and Hungary. Along with earlier solo and chamber works by Denisov, Ustvolskaya, Bartók, Ligeti and Kurtág, new commissioned compositions by Nikolay Khrust and by László Tihanyi are to be premiered at Rachmaninov Hall on February 9. Tihanyi's recently finished Two imaginary dialogues for chamber ensemble will be performed by Ensemble New Music Studio Moscow conducted by Igor Dronov. When Mr. Tarnopolski, the head of the New Music Studio Moscow, asked me to participate in this project" - says Tihanyi - "it made me meditate on my relationship to Russian culture. I realised that not only Russian music is very important for me but also Russian literature, fine arts and film. I decided to write a piece which is based on imaginary dialogs with two extraordinary directors: Eisenstein and Tarkovsky. I tried to express my reactions to their visions of the world in music and find my possible connections with them." Passport to Hungary is the title of the program to be performed three times in Chapel Hill and in Raleigh by the North Carolina Symphony Orchestra (conducted by SARAH HICKS) on 12th-14th January. The concerts are focused on compositions inspired by Hungarian folk music. Along with works by Kodály, Bartók and Ravel, Kamilló Lendvay's Concerto semplice for cimbalom and orchestra will have its US Premiere by PETRA BERÉNYI, who currently lives in Raleigh and is a devoted performer of contemporary cimbalom repertoire. The traditional Hungarian hammered dulcimer occupies an important place in the oeuvre of the 83-year-old composer - he uses cimbalom several times in his solo and chamber works and in his concertos as well. … pas a pas … nulle part, op.36 written to the text of Samuel Beckett will be performed at Zipper Concert Hall at Colburn School on December 5. The day before a documentary film on the life and work of György Kurtág will be presented than followed by discussion with bass-baritone Nicholas Isherwood and a live performance of Kurtág's Hölderlin Lieder. Beckett’s texts have been important sources of inspiration for the 85 years old composer from the beginning of the 90s. … pas a pas … was finished in 1998. His “work in progress” opera is also based on a Beckett’s play, on Fin de partie. Three short pieces for viola da gamba will be premiered by Nóra Kallai at FUGA Budapest Center of Architecture on 4th December. The pieces dedicated to professor Joël Dehais were composed in 2008 and 2011. The programme gives a selection of contemporary repertoire of the viola da gamba: besides works by Kurtág, László Sáry and András Soós will be performed brand new solo and chamber pieces by young Hungarian composers – Dániel Váczi, Péter Tornyai, Péter Zombola, Xénia Stollár and Georgi Sztojanov. This book examines the impact place and displacement can have on the composition and interpretation of Western art music, using as its primary objects of study the work of István ANHALT (1919–) GYÖRGY KURTÁG (1926–) and SÁNDOR VERESS (1907–92). Although all three composers are of Hungarian origin, their careers followed radically different paths. Whereas, Kurtág remained in Budapest for most of his career, Anhalt and Veress left: the former in 1946 and immigrated to Canada and the latter in 1948 and settled in Switzerland. All three composers have had an extraordinary impact in the cultural environments within which their work took place.